Émile Zola is most famous for his article, J’Accuse…!,published in 1898 on the front page of L’Aurore (The Dawn) as an open letter to the French president. To say the piece caused a sensation is about as vast an understatement as you can make. I only read it in the last year or so after hearing about it forever, and it still packs quite a wallop. It was instrumental in getting Dreyfus, a Jewish army officer framed for treason by a cabal of Jew-hating reactionaries, released from Devil’s Island and exonerated. In The Belly of Paris, Zola is also concerned with France’s overseas penal colony, and with accusing too. He doesn’t write with the subtle flair of Flaubert, or the locomotive-momentum of Balzac, and certainly not the suavity of Stendhal, but he has his moments! His dogged pursuit of the telling details, the research, the clear-eyed unsentimental portrayal of all sorts of people, especially those down near the bottom of the social scale, has a cumulative power. 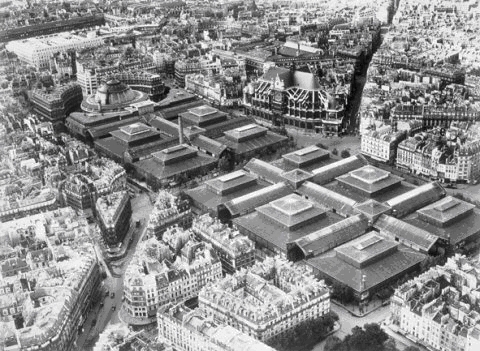 The Belly is a story of Les Halles, the enormous modern market built at the start of Napoleon III’s empire, in the center of Paris. It was an architectural marvel – all iron and glass, and covering so huge an area, it was practically a neighborhood in itself. (It was demolished about twenty years ago for a shopping mall.) The story follows Florent, returning to Paris from the penal colony where he was sent simply for being at the wrong place during a police roundup after some revolutionary agitation. He escapes, and makes his way back to the city, but he hardly recognizes it: Hausmann-ization has begun! Florent is thin. Despite living with his brother in a charcuterie, he never gains weight. His brother is rotund. How could you not be? Just reading the endless descriptions of food in this book, sausage, rabbit, fowl of every type, pastry, tripe – so many kinds, tongue, ham, veal, pate of this, pate of that, aspic, salted fat, dry fat, fat, fat, and more fat – the book is an encyclopedia of food preparation and cuisine – how could anyone stay thin? But he does, and the vicious gossips of the market (all Fatsos) get him turned in to the police for a return trip to Devil’s Island. Outside of this human polarity of fat-thin, respectable, vicious gossips vs. the loser thin types and artists is the pair of Cadine and Marjolin. They grow up sleeping together in makeshift beds, children of the street, poor, and surrounded by mountains of food. They live an almost animal existence, dominated by their romantic and carnal obsession with one another. Cadine grows to a beautiful and wild young woman, while Marjolin, always simple, seems almost retarded after he suffers a serious head injury. They carry on necking, fornicating, role playing, nuzzling, and laughing, in the piles of baskets, on the rooftops, under the streets in the dank filthy cellars while the world goes on around them. This entry was posted on Wednesday, September 9th, 2009 at 4:31 pm and is filed under Uncategorized. You can follow any responses to this entry through the RSS 2.0 feed. You can leave a response, or trackback from your own site.